← The Flavor of the day….is NOT Butterscotch. 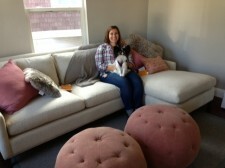 Jessamyn and Olivia in her new living room…still with tags on pillows. Jessamyn had been watching reality shows on house hunting, talking about houses, discussing real estate. But until she asked me to help her out, I had no idea she was serious. Like Goldilocks, we looked at a house that was too big. A house that was too small. And, again like Goldilocks, we found the one that was just right. The home that looked right on paper was too small and on a too-busy street. The one that needed TLC was, in fact, a total wreck. The one that seemed too cheap was located between an apartment complex and an auto repair shop. The “just right” house, it turned out, needed a new foundation. And gutters and tree removal. “And wouldn’t it look nice if it had a pitched ceiling?” asked Jessamyn. Daunting, but I was triple proud watching Jessamyn navigate the new territory, learning about mortgages and ‘sewer line clearances’ and…of course…the ins and outs of getting a new foundation. And honored that she asked me for advice at many steps along the way. 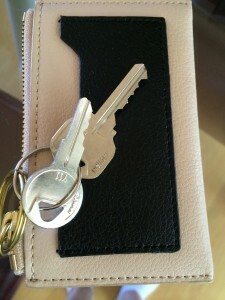 My birthday was yesterday, and my gift from her….keys to her new house! I laughed….and promised Jessamyn that I would always knock first. This entry was posted in Family, Life Experiences, Motherhood and tagged buying a new house, House hunting, reality show. Bookmark the permalink.